IMPORTANT CALIBRATION NOTICE: Calibration Service may be delayed between 11/25-12/11. The last day to send pipettes to our old address is 11/25. Do not send pipettes between 11/26-12/1. 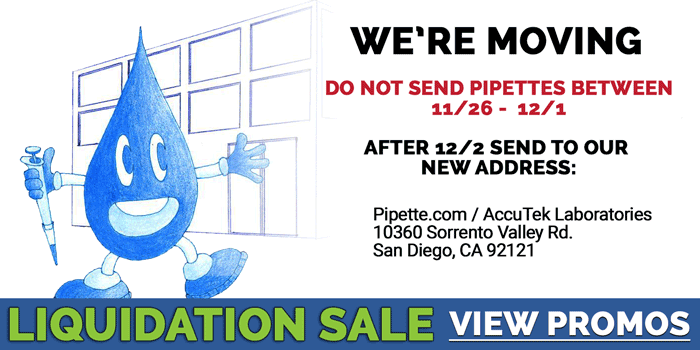 All pipettes sent after 12/2 should be sent to our new state-of-art Calibration Facility (10360 Sorrento Valley Road, Suite E, San Diego, CA 92121). Our Calibration Lab is closed Dec. 3rd & 4th. We will resume service on Dec. 7th.